A step above Persona 3 and 4's Social Links. Today marks the release of “Persona Magazine #2016 March,” which features a new interview with Persona series director Katsura Hashino, who shares new tidbits on Persona 5. The dungeon level design is vastly different from previous games. All of them incorporate different stories and can be thoroughly enjoyed. By choosing the cliched theme of “phantom thieves,” Atlus hopes to surprise users and put in more ideas than can be imagined. Atlus wants to skillfully combine contemporary drama with Persona to create something that expresses the fun of entertainment. The setting is Tokyo because Atlus wants to play out an unthinkable phantom thief drama in a world that we’re familiar with. Many of the characters are labeled, or look at things from a biased point of view and such, and are spending their days unhappily, feeling that it can’t be helped and don’t fit in. Breaking the status quo, rising up, and coming alive is how the introduction will develop. Regarding Ryuji Sakamoto: A “let’s change the world” character who pulls along the protagonist. The hero begins his phantom thieving after getting caught up with Ryuji. He’s insistent, but kind on the inside. His personality is a good match for his voice actor, Mamoru Miyano. And his Persona, “Captain Kidd,” matches Ryuji’s setting and episode. Regarding Ann Takamaki: A quarter-American character who has returned to Japan and is well liked, but doesn’t have friends and, though she stands out, is cut off and isolated from her surroundings. After becoming your friend, her bright personality makes her the lively mood maker of the group. Her Persona, “Carmen,” has a femme fatal side to her, and in an incident related to Ann, the protagonist and Ryuji will take on a fight in the other world. In this sense, Ann will have an influence on the fate of the protagonists. Regarding Morgana: A character similar to Persona 4‘s Teddie that will help you navigate the other world. Having previously been involved in the phantom thief business for certain reasons, she also bears the responsibility of training the protagonists as phantom thieves. In the real world, Morgana takes on the form of an ordinary cat, and Hashino wants you to look forward to the reason why that is. Morgana’s Persona, Zorro, is her admired form. Because she’s usually small and called with a “hey, cat,” Morgana’s Persona takes on a macho form. Regarding Yusuke Kitagawa: An eccentric character whose illustration may give off a different appeal. He has talent as a painter and is also an art scholarship student. There will be a system similar to “Social Links.” Is communication the driving force for those who are trying to make a change? With that question in mind, Hashino says that it will be good if Persona 5 depicted human relations a step above Persona 3 and Persona 4‘s Social Links. Atlus is celebrating the 20th anniversary of the Persona series this year. 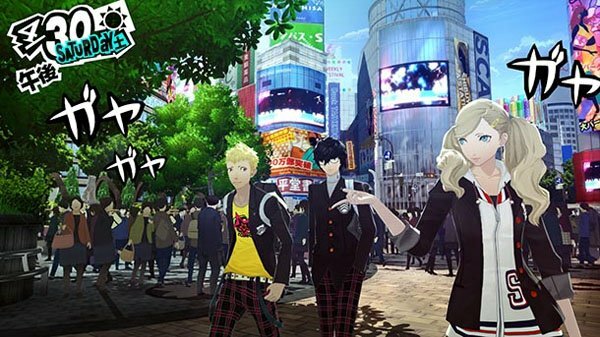 Hashino says since Atlus is thinking about making an announcement that will please users, while first waiting for Persona 5, to look forward to something in that area. If you’re interested, scans of the magazine are available at Ruliweb. Persona 5 is due out for PlayStation 4 and PlayStation 3 this summer.